In a city with as rich and vibrant creative circles as Glasgow, there is no shortage of artistic endeavour, achievement and expression to explore, consume, or participate in. Neglected urban spaces vie with reinvented neighbourhoods as an edgy, creative energy, continues to shape aspirations for a city. The Turner Prize exhibition, brings a juggernaut of expectation, debate and ideas to the city’s art scene, and clearly a wider audience. Often contested, it offers artists an opportunity for their contribution to creative practice to be held up as outstanding examples of self expression, or as is perhaps more applicable today as communicators or agents of ideas to an inquisitive and culturally diverse society. There will always be work by deserving independent artists, overlooked and absent, yet equally or more talented in terms of their creative output, and to that extent, a degree of superficiality or irrelevance to everyday life risks pervading such prizes and their impact on our lives. One project stands out from what at times are overtly conceptual, and bizarre rich pickings of the art world this year, that I wanted to try and write something in response to Assemble’s architectural, collaborative and transformative project that breathes new life and hope into the fortunes of simple terraced housing; their people, and the Liverpool 8 area. For me it is the most interesting, vital, and refreshing nomination, in terms of its creative process, presentation and as a vehicle for creating positive change. The historically, politically, and socially charged notion of place and identity within Liverpool’s Toxteth, is the backdrop to this story. A celebration of human desire for a sense of home and security, overcoming scars of hostility and neglect. Once a beating heart of trade, colour, and brick or ‘brownstone’ streets and homes, the ‘Brooklyn’ of Europe became stigmatised by physical and social decline, culminating in the fallout from the heavy handed and racist policing that instigated the riots of 81. Across the UK from London to Manchester & Glasgow, streets of decent housing and tenants were decimated by the comprehensive ‘clearance for redevelopment’ through concrete megastructures and master plans. Poorly managed and realised this vision failed spectacularly, often amidst a sea of disrespect and distrust for the people who knew the place the best. An all to common story of a blighted inner-city drained of opportunity and vitality was later realised in Liverpool 8 by the 90s ‘Pathfinder’ scheme. The reality; vacant sites and streets left boarded up awaiting the gradual process of identifying development sites, redlining the boundaries of land parcels to become commodified entities in their own right; subjected to the decisions of organisations detached from an area’s best interests, and all too often tinged with discriminatory undertones. Promises left undone. 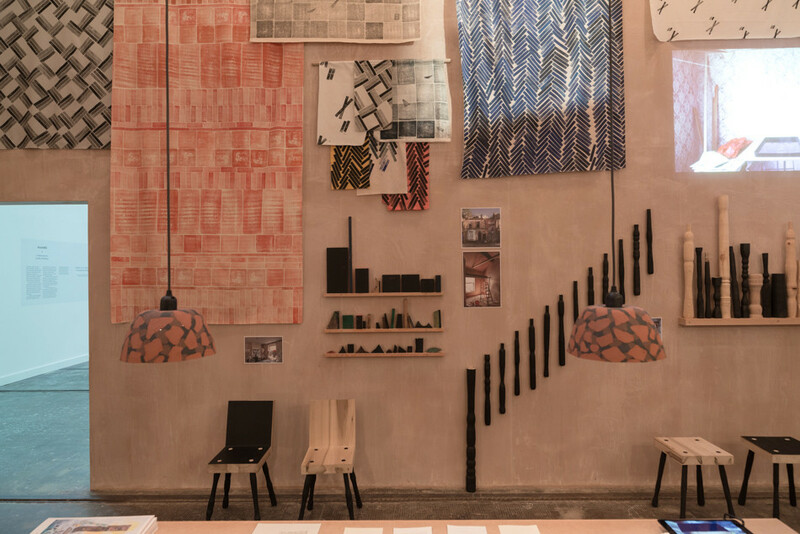 Assemble a collective of architectural designers, makers and artists bring a contextually appropriate, and collaborative way of doing things. They became involved with the renovation of the Granby Four Streets, after years of unwavering commitment from residents, enabling the formation of a Community Land Trust, and a campaign to secure a future for houses destined to be demolished as part of successive failed measures to manage the decline in the area’s fortunes. 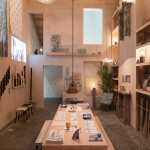 In today’s climate where some of the best examples of art can be read as operating on many different levels, whilst land development is too often centred purely around profit, (at the expense of local peoples fulfilment and authorship) Assemble’s project is both poignant, uplifting, and calls for a critical re-evaluation of the ingredients for building neighbourhoods. That’s good enough for me and I hope this project walks away with the prize. Displayed through the lens of a gallery, and viewed in the context of our built environment, the subject matter (material) of unassuming, yet obliterated and neglected rows of terraced housing made good, becomes symbolical of our nation’s relationship to housing; our ability to resist and overcome political and social hardship, and of an intrinsic beauty in working together to determine a positive physical environment. 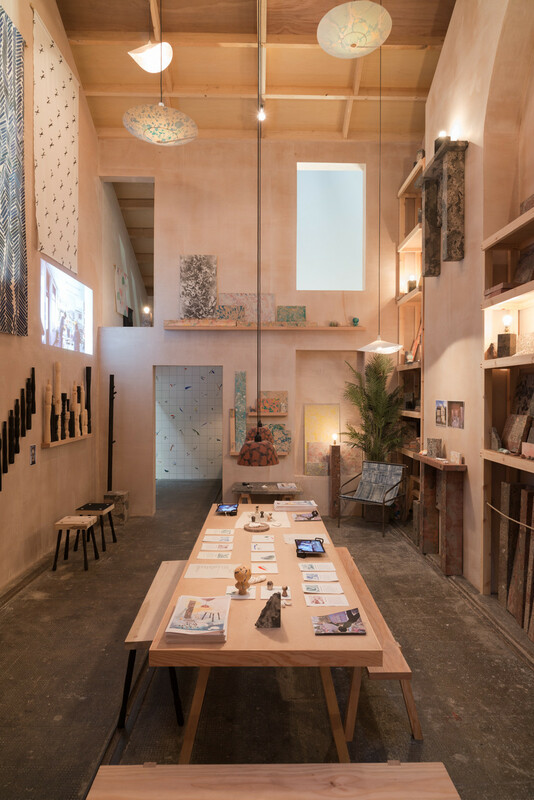 As clever as any conceptual image, brush stroke or idea formation, was the idea to deliver the Turner Prize exhibition through a physical reconstruction of a house as a showroom of products available to buy online. ‘Granby Rock’ or discarded brick and stone rubble, recast with colour pigment and sand, become both polished products, lamp stands and fireplaces, and iconic gestures in creating a home. There are tiles and tables, fabrics and door knobs, all tactile and colourful in their burnt umbers and siennas, made with a sense of fun, reconstituted from the essence of the place, and sold as a vehicle to provide training, skills, and financial momentum to further the benefits of the project. 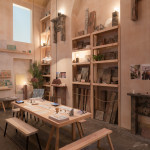 Creating a positive impact on people’s lives far removed from the gallery is a refreshing direction for the Turner Prize, not least the art world generally to direct attention to, and the inclusion of an essentially practical, yet imaginative and collaborative process within the setting of a gallery, enables wider issues such as the potential 27,000 empty houses in Scotland alone have for refurbishment, re-imagination and reuse to be highlighted. The rise in community enterprise, self initiated and community driven authorship of projects and land-use is an approach rising in popularity due to the lack of publicly funded investment, the encouragement for diverting power to local development trusts, and essentially a growing ideology and belief amongst designers, communities and facilitators, of ingredients and processes for making and shaping space, outwith the shortsighted pitfalls of much commercially & profit driven development. It is of no coincidence, but through a shared understanding of site specific and collaborative practice that a live site reimagining is beginning to take shape directly opposite the Tramway; and it is exciting to see the venue for this years prize also forge creative avenues into the wider infrastructure of the local community. 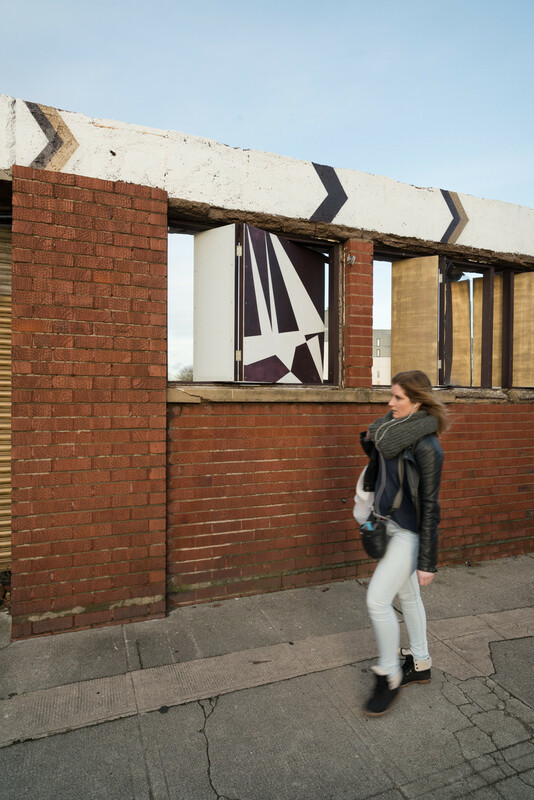 A temporary and generous lease of a vacant urban plot has enabled the set up of Pollockshields Playhouse, a testing ground for people and groups within the community to experiment with ideas of how they would like to use and animate the space. 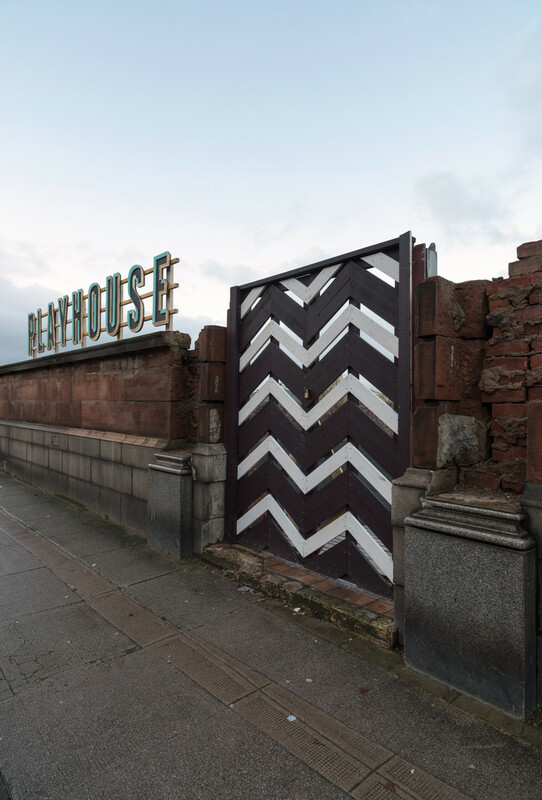 Having assisted Assemble in the ongoing development of their Glasgow project for Baltic Street Playground, architect Baxendale and artist Rachel O’Neill lead the project and bring a hands on, engaged and collaborative formula to reinventing spaces and places. Working with, illustrators and artists, and with open doors to creative groups and participants within the area, the project has been gradually materialising throughout the duration of the Turner Prize exhibition, with Glasgow based Recoat creating an eye catching mural to adorn the perimeter of the site, and graphic designer Kat Louden developing type. 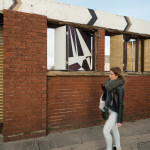 These interventions into an existing wall and boundary have created a presence and sense of mystery to the street with text and signage referencing old cinema halls – playfully inviting people to take part in making something of the place through a program of events and realisations that run through the next year. 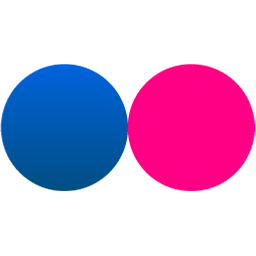 The project is unique in its ability to galvanise and bring people together, test new creative realities for Pollockshields and hopefully will identify real interests from participants for taking further. 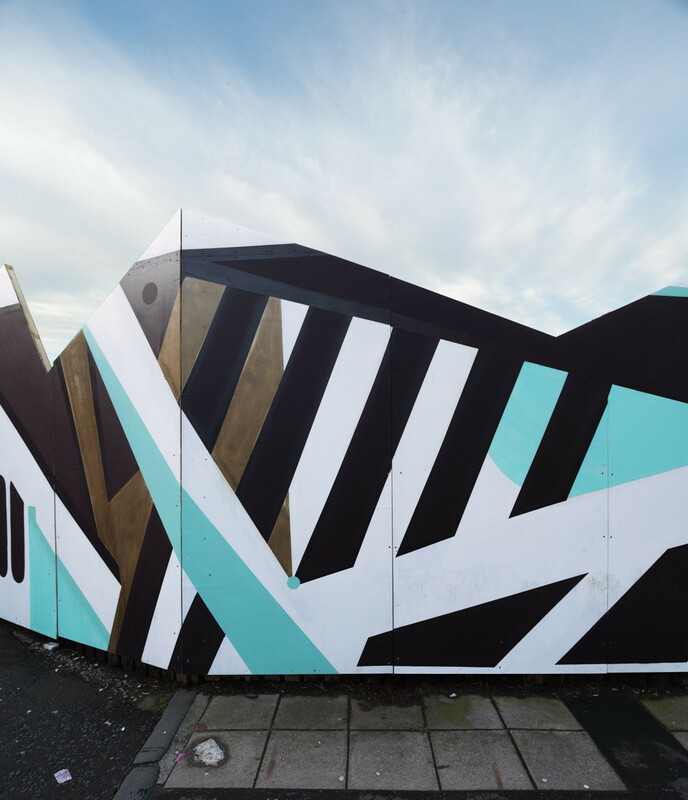 With the design focusing on enabling a range of activities, and a process led by artists, skilled experts and the community, it is up to the people of Pollockshields to make this a success. This is hands on and real. An opportunity to reflect and act. Creating value and use in every day materials put together with drills, hammers, sweat and imagination. It questions what people can do to a space, and who has control of places, turning on its head the prescribed notion of ‘take what is being offered’ notion of development that lands on many communities doorsteps through more traditional and distant mechanisms for renewal. The developer could even take note of what flourishes on the site when it comes to finding more permanent solutions for the site, and has enabled a model which could see real change in how ‘stalled and vacant’ land is energised and explored. Accessibility is key here. Inviting people to take part, and have ownership albeit temporally in creating a future. Letting outcomes take shape organically and enabling people to have the conditions to be able to analyse and experiment in alternative visions offers lasting change and permanence to be delivered through an approach centred on what local people can contribute. 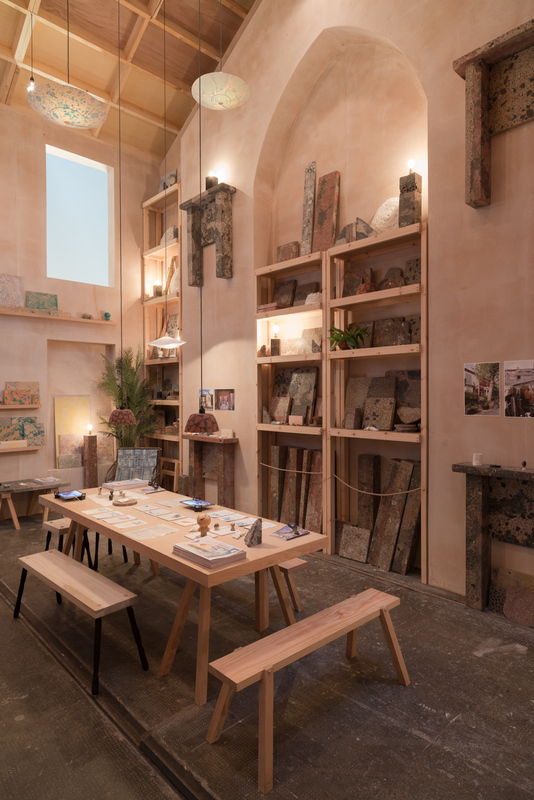 Returning to Assemble’s Turner Prize, strong accessibility and engagement for visitors holds it up for me…in addition to its real world impact. The Turner Prize has undoubtedly presented a wide spectrum of artwork – almost encapsulating its diversity over all its previous and controversial years entries. In so doing one can argue the Turner Prize is still trying to define itself and to identify elements and values on which art is to be assessed. 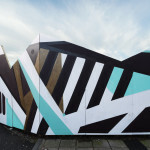 In one sense anything goes, however appealing and connecting to the public is surely a desirable attribute, let alone improving well being for a new generation of residents. 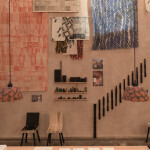 Assemble’s work makes a point and makes a difference. Good art for sure. 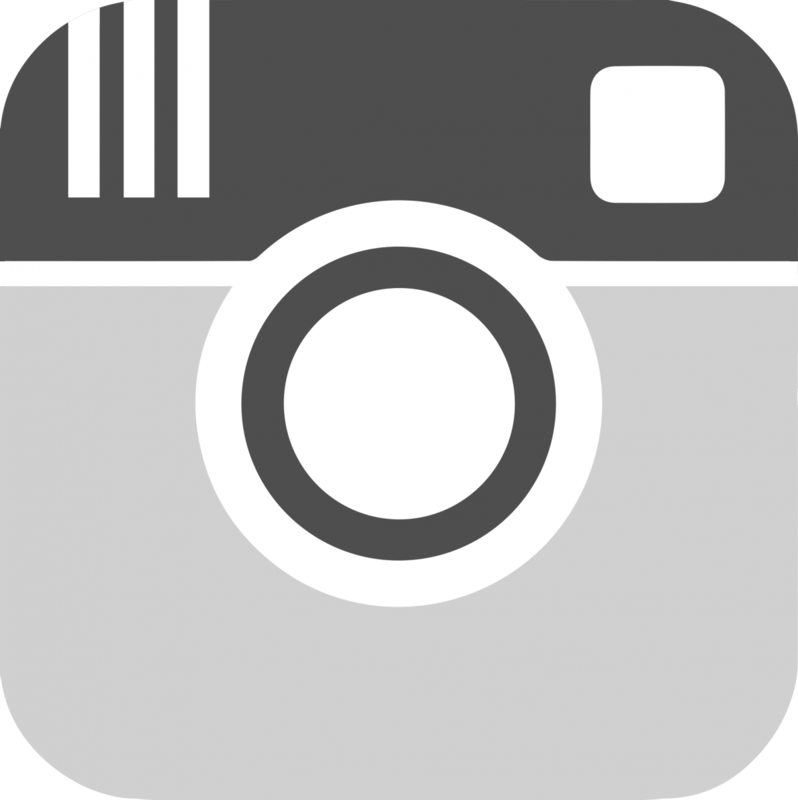 This entry was posted on Saturday, December 5th, 2015 at 12:33 am. 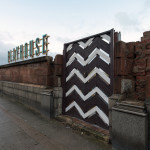 It is filed under Blog, Features and tagged with "placemaking", "social enterprise", "urban landscape", 2015, Architecture, Architecture Photography, Art, Assemble, Baxendale, Commentary, community, community regeneration, development, exhibition, Glasgow, ideas, Liverpool, place making, Pollockshields, Pollockshields Playhouse, RECOAT, Regeneration, Review, Toxteth, Tramway, Turner Prize. You can follow any responses to this entry through the RSS 2.0 feed.